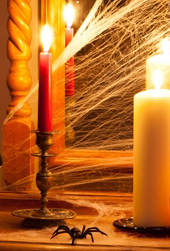 A bad witch's blog: Witches: Do Cobwebs Help or Hinder Your Magic? Witches: Do Cobwebs Help or Hinder Your Magic? Last week I was lucky because I didn’t have any work for three days. Now, I can understand you thinking that not having work for three days isn’t really that lucky at all – and being freelance means that when I don’t work I don’t earn. However, having three days off gave me a chance to properly clean my house. For a good few months before that I had been so busy, all I’d had time to do was the washing up, laundry and sometimes run the vacuum cleaner around when the floor got crunchy. Yes, I know that’s disgusting, but I would rather spend my spare time making magic – or blogging – than dusting cobwebs from corners. After all, a witch’s house ought to have cobwebs – at least that’s my excuse. I even put up fake ones before Samhain, as you can see in the photo to the right. Mind you, most of the modern witches I know don’t subscribe to the idea that real cobwebs, dust and clutter are a good thing at all. I know my fellow Moon Books author Rachel Patterson, who I greatly admire, subscribes to the view that cleanliness is next to goddessness. In her book The Art of Ritual, she says that when doing any magic indoors you should “give the place a bit of Snow White attention before you start”. The truth is, I agree with her. The problem comes when you really need to cast a spell, but simply don’t have time. What do you do? Well, I would say try to find time to at least clean the space you are going to do your magic in. If you are working alone, that could just mean clearing a little circle in the middle of your carpet. Give it a bit of a sweep, either with an old-fashioned broom as is traditional, or with the Dyson. Then visualise stagnant energy being whisked away out of your circle. Another thing you can do is get a circular rug that you keep clean and put down on the floor just when you want to cast a spell or do a ritual. You can think of it as your magic carpet! 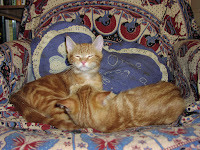 I used to keep a lovely Indian cotton printed throw with a circular pattern in the middle for that purpose – before it was adopted by my cats when they were kittens and ended up being used as a cover for the chair they liked to sleep in (you can see an old photo of them on it to the left). Mind you, I recently saw a survey that made me realise I am not alone – and certainly not the worst witch – when it comes to being untidy. The research was called #dirtylittlesecrets and revealed that one in five of us in the UK sometimes wear dirty clothes taken from the linen basket because of not having time to do the laundry. The research also revealed some useful tips to encourage cleanliness – a quarter of those questioned said putting on music motivated them to clean and 26 per cent said they tidy up when they know they have guests coming over. That was one of the reasons I was so pleased to have time for a spring clean last week – I had friends coming round to celebrate my birthday and I would have been very embarrassed if the place was the total tip it usually is. 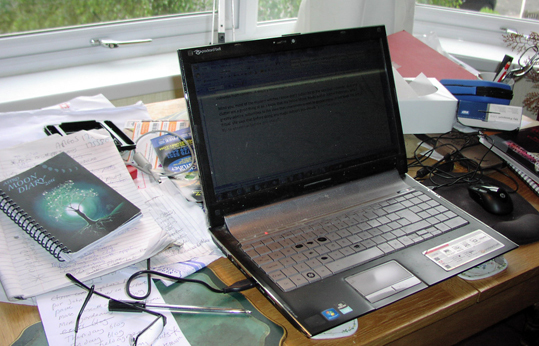 Just see the photo below that I took of the table I work on to get an idea of my messy habits! The research also highlighted that, according to a massive 90 per cent of us, the reason we don’t clean is down to lack of time, with over a third attributing this to spending too much time working. The study was done on behalf of method, a company that produces environmentally friendly cleaning products, and obviously wants us to do more cleaning. Hmmm – wish I could afford to employ a cleaner – that would solve my problems. But what do you think about whether having a clean house is vital for witchcraft to work? Do you make like Snow White when you are casting spells, or do you think cobwebs add to the atmosphere? Do leave a comment.